We'll fine you, but who will fine us? And New Recycling Guidelines. I love this city, but it does some weird things (see DPAC/prison proximity). Oops, Durham doesn't actually do anything special with those $78/year for yard waste brown bins and pickup. It just goes to the landfill like the rest of the trash even though there are separate fees and trucks. The story, which was forwarded to me by a friend who got it from a neighborhood mailing list, is from our local ABC news, titled, "Yard waste mixed with garbage in Durham"
It shouldn't be that big of a deal, but if the city makes you keep another huge cart at your house, threatening to fine you if don't use it, and then at least implicitly promises some good will come of the effort, then some trust is shattered. We follow the rules because the rules are supposed to make our city and world better. And better in an efficient manner. Money needs to be spent where it will have the greatest impact. I live in a new area without big trees:( so a mulching mower is all we need. But for many people in denser areas who even juat need occasional yard waste pickup, this is a big deal. 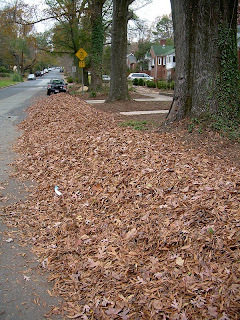 They are paying extra money every month when they could just throw some leaves in the normal bin. Maybe people should start a compost pile at City Hall. It's all in the same code, so you presumably would be fined $50 for littering at city hall versus $50 for putting your yard waste into your normal garbage bin. Leaves of the world unite! I'm certainly not really suggesting that, but the address rhymes with 101 City Hall Plaza, Durham, NC. You can still be fined $50 for putting yard waste in your normal garbage can - the yard waste prefers its own ride, even if its end up at the same destination.It doesn't want to split the taxi fare with those creepy diapers. From the ABC article: "But city leaders say while the service may seem redundant, it's not losing that much money." It's never that much money when it's not your money. This has been in the news before because it's been a problem for 3 years. In Northern Virginia, the county doesn't run the trucks for garbage pickup. So if you use less trash and wanted fewer pickups, you can pay less. Or if you were dissatisfied, you can switch companies. I checked and one company in Virginia offered garbage, recycling, and yard waste for $17/month. It's hard to tell how much we pay here because it's rolled into our property taxes, but yard waste alone costs about $6/month. Trying to decipher the online budget, trash and recycling could cost around $10-$15/household/month, depending on how you allocate administration and transfer station costs. The whole solid waste program costs Durham about $20 million a year for about 75,000 households, so the high end of costs could be $27/household/month (and it would probably be higher if all houses paid the $6/month yard disposal fee). Interestingly, the budget includes $364,451 for the yard waste composting facility that the articles show isn't used. This includes expenses for three 3 full-time equivalent employees. I hope they are not actually spending this budgeted money. Also, recycling services are not offered to businesses or churches. Since there's no competing trash services in town unless you have a dumpster, it's hard to get recycling services, especially for smaller nonprofits (I've tried - they don't return my calls). A couple of weeks ago, I got a very un-detailed offer in the mail about attending an event that would help me create or enhance a web business. It offered a free lunch at the presentation and free MP3 player. I already have two free MP3 players, but I only had to open a checking account and complete a survey for the other for those. So why do I need another – I could visualize scenarios where the other two were in use, and a third would save the day! Okay, free is addictive. And a free lunch just tastes better. More legitimately, a friend does sell beautiful cards over the web, and I hoped to glean tips to advance that (see http://larachasephotography.com ). I am sitting in a ballroom at the Marriot at RTP with about 100 people who have come for a free iPod, free lunch, and maybe some information on Internet marketing. Even at 5 minutes before starting, it smacks a little of a scam. A testimonial on a brochure says "that speaker changed my life." “All testimonials shared at this event are not typical” is presented on a small portion of the screen up front. It is an exclusive event, a fact that is shared with us several times. It’s a crowd on the older side. The cars in the parking lot don’t seem especially nice or especially bad, so I guess it is a middle class crowd. It’s racially diverse, so I guess they choose a cross section of Durhamites and not the majority white Cary residents working next door in RTP. I don’t know how they choose us, exclusively. They never say. What about me statistically says that I am a sucker? The presentation is by an enthusiastic motivational speaker-type salesman. He uses a sermon style call and response. “Do you want to make more money using a web site? The crowd responds, “Yes.” My pastor doesn’t use this style. When he asks a question, he would prefer that you disagree with him than tell him a scripted answer. “Who here uses the web regularly?” Raise your hands. The crowd obliges, as do I from peer pressure although as the presentation goes on, it becomes more of a hand flicker. The Indian guy a row down is even less enthusiastic, but most people are into it. Web site logins would be available at the end of the presentation, with sites instantly ready for design and selling. He then tells us about drop shipping, selling first on your web site and then buying the product afterward to ship directly, with no risk and no effort! No risk and no effort, why hasn’t anybody else thought of that? Now we start to get to the details: he announced a $199 one time startup fee, with a $24.95 / month published-site fee. But you can save big today and the $199 fee gets reduced to $58 if purchased today, confirming my fears about timeshare type selling. The time share people had previously gotten to the most fiscally conservative family on my street. If they could them, they could crack anyone. My parents seem to be gradually more tempted by the 3 hour presentation. That’s not always a scam, but for a lot of the audience a week of paying for hotels would be cheaper than the annual fees, let alone the upfront capital. The same story for the web site, a cheap Yahoo store or eBay site, would be a better start. Part of this was a test: could I remain cynical and not buy anything? I didn't entirely trust myself -I thought of leaving all credit cards and checks at home. I often cannot resist new technology. But my wife’s Etsy site was almost free, with fees as you sell. My domain is $10 a year. Then we get deeper. Having a site is not enough – you need SEO, search engine optimization, to make your site number one on search engines. The pro version of the site tool will only cost you $3600. It sounds like a lot, he says, but the 20% of the people who make 80% of the money aren't afraid to spend the money buy the pro version. Financing is available. "Stinkin' thinkin’" prevents you from making an investment. I call it “reasonable prudence” to require a business plan and a product before investing thousands of dollars. (By the way search Turf Management Ethics, and we are number one. Obscurity breeds searchability). At 13:07, I want lunch – I haven't listened to a single speaker for 90 minutes for years. Then we get an announcement that we can know even more! On Friday Jan 22, there will be a marketing workshop from 9-4. With the setup cost of $199 reduced to $58 today, the cost also includes workshop, but only if you buy today. Did I mention that you NEED TO BUY TO-FRICKIN’-DAY. That workshop would then give you the opportunity to buy the search engine strategies for thousands of dollars. Okay, you ratchet up the pressure high enough, and I’m getting more suspicious and much less interested. It goes from a bad deal to almost cruel, when he mentions that your card or check will not be billed until next Monday, so you have time to get money in the account. Should you be buying this if you don't have $58 in your checking account? “Was it worth it to the women who could stay at home with her kids?” he asks. My stinkn’ thinkin cynicism shields were up. If I had to do it again, I hope I would have stood up and announced a scam alert. It would have taken a few minutes for security to drag me out. I could have bought my own lunch. I don’t want to be paternal, but that guy in the wheelchair and people of various ethnicities had suffered enough – they didn’t need to spend money that they wouldn’t get back. On the other hand, it seemed pretty obvious that this was not a good deal. Why didn’t everybody walk away? I guess if you are shown enough successful Superbowl athletes, you start to think you can catch that winning pass, too. Call it the American Idol Syndrome: U2 sings and makes a lot of money; I have a mouth, just like they do. My mouth can move air, so I can make a lot of money, if I just sacrifice enough. The idea that the presented results are not typical took up less than 1% of the presentation, but was 99% of the importance. Economists call this a tournament system – the top dogs do very well while everyone under them gets very little. So pray that the electricity goes out in downtown Durham on January 22, so that people won’t buy the expensive SEO options, without careful financial planning and a business plan. But history says people will buy it. And for most people it will be a lemon, but without the scrap metal and used tires to sell off. In the end, I don’t know if it’s technically a scam – it’s just a hard sell with very one-sided information. 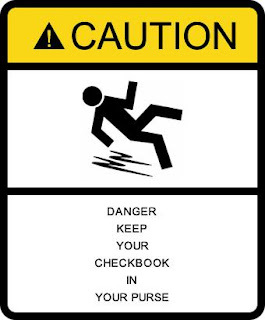 They are not stealing money out of your bank account. They just appeal to your desire to be well off and independent and get you to write the check. Avoid Disappointment and Future Regret. ACT NOW! A New Year's resolution, perhaps: Avoid disappointment and future regret. ACT NOW! Say it louder. It's actually a line to get you to buy, among other things, the Jesus Coin, which is a way to love God and money, too, even at the same time. I forgot to put it on my list. For the record, I try to just substantially appreciate and like money in a strictly platonic manner. My non-love may be true, or I may just be a bad suitor because it ain't returning the love. My big haul at Christmas featured two head lights (lamps strapped to you head, more later) using multiple LED bulbs. And finally a record player to play the few records I have collected and been unable to play. My life has more of a "Seemed like a good idea at the time" feel than "Avoid disappointment and future regret." I don't know how you can avoid future regret, a phrase designed to create current anxiety about future feelings related to current decisions. Decisions branch our lives out into multiple paths, some of which close off other branches. At some point, we are going to wonder about the branches not taken and mentally wander into a maze of what-ifs. I can have it both ways. I'll worry if I buy the coin or if I don't buy the coin. Okay, not the coin, but most other stuff. Maybe that's why it's comfortable to watch infomercials - you can be as a certain as a Texan buying a gun that not buying the infomercial product is the right decision after a half hour of cheesy hard sell tactics. (This vacuum cleaner can roll in 4 directions while others only do 2 directions, a tragedy!). Some comforting rituals avoid a little anxiety with premade decisions: McDonald's, a number 10 meal with sweat and sour sauce, for here, swipe credit card, fill drink, grab meal, sit in my regular table, watch CNN and old men arguing at big table. If I go to Subway, I have to decide about meats, cheeses, breads, oven options, toppings - it's too much like a job. Okay, let's stop here. The moral of this post: don't forget that doing nothing is a viable option. Acting now doesn't always move you ahead. I had unclearly asked for at-least 4-LED lights, which I thought meant one headset with several LEDs. I can see now how this could be interpreted as 4 sets of headsets, especially in my enthusiasm for the functional, if not fashionable lighting solution. So I was lucky to get only two, but still pleased because you can never have too many, so that you find at least one when you need it.